is a tool that any custom printed products website needs. This fully-featured software allows visitors to create their own design of t-shirts, mugs, bags, stickers, cards, engravings, etc. by choosing color, size, text, clipart and photo. is a tool that displays detailed information about your products in Google search results. It helps users to estimate the relevancy of their search queries and may result in more clicks to the pages. allows customers to scroll down the long list of products or website content instead of clicking a page after page like it is done in standard pagination. add the tab "FAQ" on a product details page, where customers and administrators can submit questions and answers about the product. Thus, a customer can get/gather all necessary information about the product and take a decision about the purchase. View here the whole list of Alt-team add-ons for CS-Cart shopping cart system. 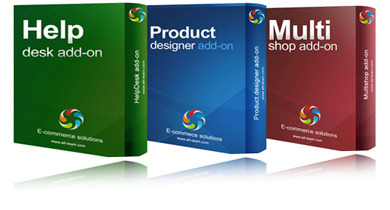 Add-on represents a program utility which allows you to enhance software functionality. Add-on is a module designed in order to complement another product that is why it can be commercial. to keep the store up-to-date. start using the add-on by following the instructions. "Thank you for your work! Your addons are just wonderful!" "A piece of erduitoin unlike any other!"